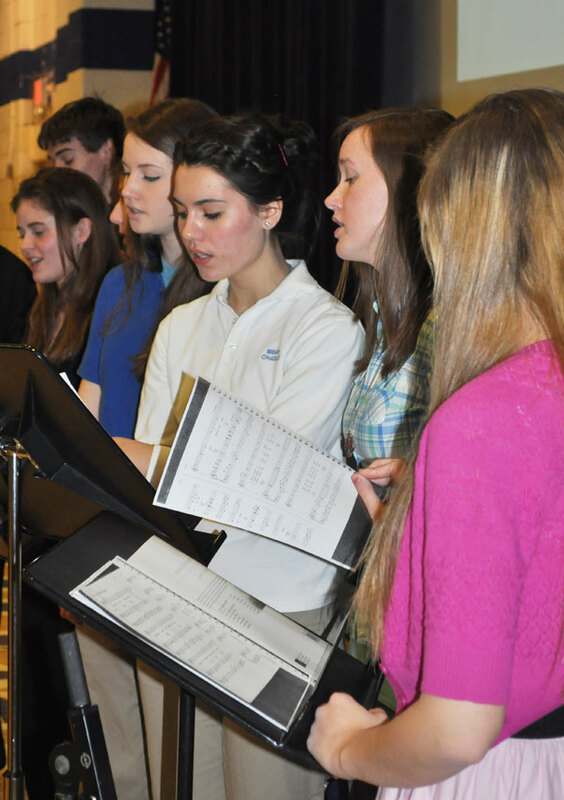 From left, Katie Gozdecki, Nicole Lehrman, Madeleine Jurkiewicz, and Elizabeth Bain sing at Bishop Chatard High School in Indianapolis during one of the monthly all-school liturgies in the 2011-12 school last year. All four girls are part of the liturgical musicians group, which leads the student body in singing at every Mass. (Submitted photo) Click for a larger version. The worshippers at St. Therese of the Infant Jesus (Little Flower) Church in Indianapolis rise from the pews and reach for their hymn books, preparing to sing along with the organ. But at this Mass, no traditional hymns are heard. Instead, everyone follows the lead of a teenaged guitar player. As he strums his guitar, everyone claps in a lively rhythm that resonates off the old stone walls of the church. Similar to other celebrations of the Eucharist across the archdiocese, this youth Mass involving high school and college students seems to bring more energy and life to the church. Madeleine Jurkiewicz, a senior at Bishop Chatard High School in Indianapolis, sings in a liturgical musician group there and at nearby Christ the King Parish. As a young musician, she recognizes the importance of music in the liturgy, especially among the younger generation. When Jurkiewicz is singing at the front of the church, she feels connected to the entire congregation in the parish. To bring out the strong emotions and youth participation, many parishes provide youth Masses. St. Jude Parish has implemented a program in their youth ministry called Life Teen, which is designed to excite teenagers about their faith. In its second year at St. Jude, the Life Teen program has made an impact, Brown says. The parish hosts a youth Mass every Sunday at noon, creating an attractive, comfortable and spiritual atmosphere that draws high school students. The main goal for the Life Teen program is to bring back the youth and remind them of their faith, Brown says. “I hope I can energize teens through music so their faith becomes stronger,” she notes. Little Flower Parish has also developed a youth-led music program for one of its Sunday Masses. Twice a month, the youth choir leads the parishioners at the 6 p.m. Mass on Sunday. Tom Costello, director of the youth choir since 1995, started the program to immerse the students in their faith. The response has been rewarding, Costello notes. A large number of teenagers attend the Mass and so do older parishioners who appreciate the increased energy of the teenagers and the more youth-oriented music. Kaleigh Wilham has experienced that motivation from being part of the youth choir at St. Jude Parish. Participating in the music of Mass is a different feeling than just listening to it for many high school and college students. “I love to sing, so to be able to bring one of my hobbies to my faith life allows me to use a gift God gave me, and give it right back to God,” says Madeleine Jurkiewicz. Olivia Belles, who sings in the youth choir at Little Flower Parish, agrees that participating in the Mass changes her experience. Youth attendance and participation in Mass is important for many reasons. Music is a way for teens to express themselves and share their gifts with God. “Being around kids my age that enjoy the things I do and doing service at the same time has shown me how fun service can be,” Belles says. The participation of young people at Mass is also important to the Church, according to Charlie Gardner, executive director of spiritual life and worship for the archdiocese.